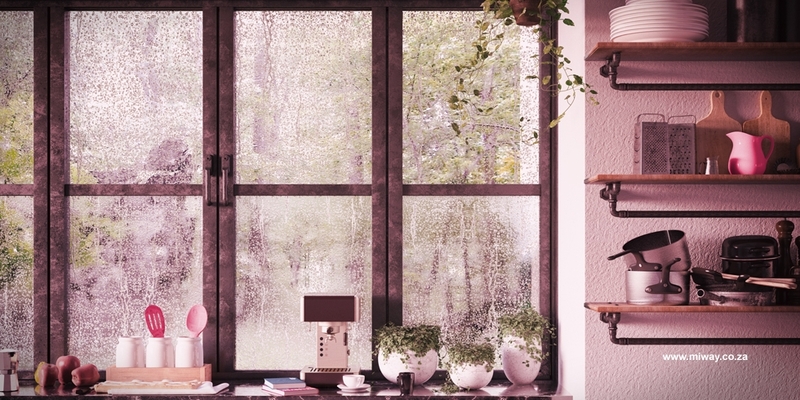 There’s nothing quite like the soothing sound of rain when you’re safely inside your home. However, the past years’ stormy months have presented us with a couple of extreme weather conditions which have caused extensive damage to property: forcing homeowners to take preventative and precautionary measures. Avoiding the storm may not always be possible, however, there is always something one can do to minimise the extent of the damage. Get up there! Inspect your roof for rust or holes that could result in leakage and cause further damage when the storm hits. Ensure all the little niggles are taken care of and that your roof is stable and strong enough to withstand the storm. If you live in a thatched house, ensure that your lightning conductor is SABS approved and has been treated within the last 7 years. Get your hands dirty! Regularly clear your gutters of leaves and any other debris to prevent water pooling up and causing damage. Additionally, once you’ve cleared out any debris, use a hosepipe to wash the gutters down and check if there are any leaks, blockages or overflows that need attention. Seal the perimeter! To prevent unnecessary storm damage, take a walk around your home and identify areas that may need attention: downpipes and drainage systems should feed water away from your structure; keep an eye out for any obstructions that could prevent water from flowing away. You don’t want water seeping in from all angles and causing more damage to your home. Maintain your yard! As beautiful as trees and large plants look in your garden, they could pose a threat in a storm. Ensure that trees are cut or neatly trimmed and are away from the house to prevent them from falling on the roof or smashing through the windows. Inspect your windows and doors! Check your windows for chips or cracks. If your budget allows, consider upgrading to impact-resistant windows and doors for a more solid barrier to weather the storm. Protect the plug! Always remember to switch off and unplug appliances during a storm. In order to avoid compromised security as a result of your alarm system being “burnt out”, install lightning surge protectors at plug points or a heavy-duty surge suppressor to your main electricity distribution board. Be informed! Staying informed through weather updates can help you and your family prepare for storms and avoid substantial damage to your home. If you’re a MiWay client, you’ll already know that we send all our clients warning notifications before a hailstorm is about to hit the area. Regular home maintenance is very important in keeping your home standing through the seasons. At MiWay, we understand that we don’t just insure things – we enable our clients to live their way. And just in case Mother Nature deals you an “unexpected blow”, our comprehensive car insurance and home insurance clients have access to a quick and easy online claims process.